We’ve become accustomed to highly detailed 1:18 and 1:24-scale models, but fine detail and working parts at 1:43 scale is much rarer, until now. 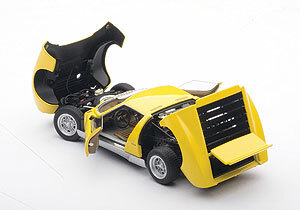 Autoart’s finely sculpted Signature Series moves to 1:43 scale with a beautiful Lamborghini Miura. 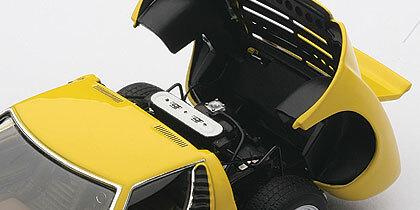 Previously Autoart had reserved the Signature Series for its 1:18 models. 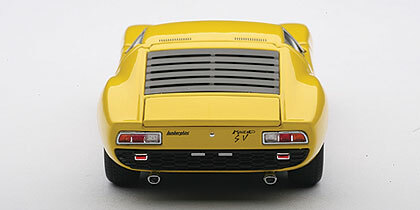 The Miura though, at just 4 inches long, is chock full of details befitting a larger scale model. 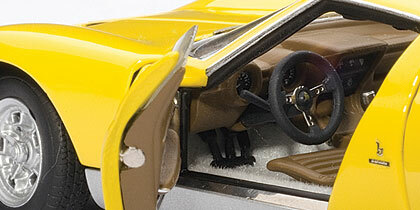 In fact, Autoart tells us that 468 parts go into the Miura and most are metal. Not only do the hood and engine covers open, but so do the doors and trunk. Seams, fit and finish are astonishing for the scale. 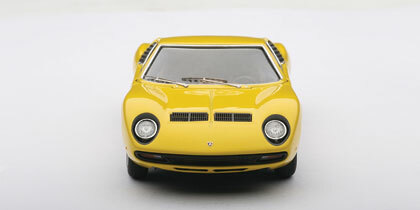 Miura is a good choice for such detailed attention, being one of the early two-seaters that led to today’s exotics. It was a styling icon of the late 1960s and early ’70s and put Lamborghini on the map among high-end automakers. This is the SV model introduced at the Geneva Auto Show in 1971, SV standing for Sport Veloce, which translates to “tuned fast.” Duh! 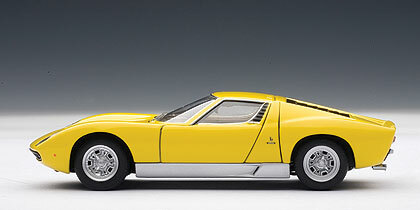 Miura was fast, due to its light weight (2,850 lbs. ), and 385-horse V12 that sits right behind the driver. Top speed was 170 + mph. That’s still extremely fast today, just not “super car” fast. The Autoart model finely replicates all that and offers some surprises too, from steerable wheels to dual photo-etched mesh hood flaps that opens. Under the hood is a finely reproduced suspension, radiator fans, wiring and a spare tire. Everything opens, just like in a premium 1:18 die-cast car. The rear bonnet flips back to reveal the Lambo’s monster V12 with white header covers, rear suspension parts and some plumbing and wiring. At the tail is a small opening trunk. Miura features silver wheels, but the tires carry no identifying branding, although the originals were Pirelli. Both side doors open to reveal a nicely detailed tan and brown interior. Certainly this isn’t as heady as a 1:18 interior, but includes gauge faces and metallic three-spoke steering wheel hub, shifter and ribbed bucket seats. Possibly most impressive is the small car’s finish, which Autoart says includes 133 steps of free spraying and 76 of mask spray painting. All painted surfaces are smooth and richly covered, the result of the entire body being hand polished before and after painting. Meanwhile the windshield and side windows are silver hot-stamped to resemble chrome plating and the windshield wipers are delicately reproduced. Head and taillights are trimmed in chrome too, the rear ones looking almost jewel-like. There also is good underbody detail front and rear, such as dual chrome-tipped exhausts. So the Miura displays well on the mirrored-bottom display case that it comes in. These models also are hand-numbered and come with their own small magnifying glass with a thin pointed end to help you open the doors and hoods without scratching the model’s surface. This is a premium item for premium die-cast collectors, no matter the scale. Even collectors of 1:18 scale may find this miniature difficult to pass up and a great way to supplement their plastic model collection, or fill a niche with a smaller die-cast model that easily fits in any display case. Miura is an aspirational model and surprising in its detail, proving that good things do come in small packages! The interior is nicely detailed for 1:43 scale too. Open the bonnet and see the finely detailed V12.